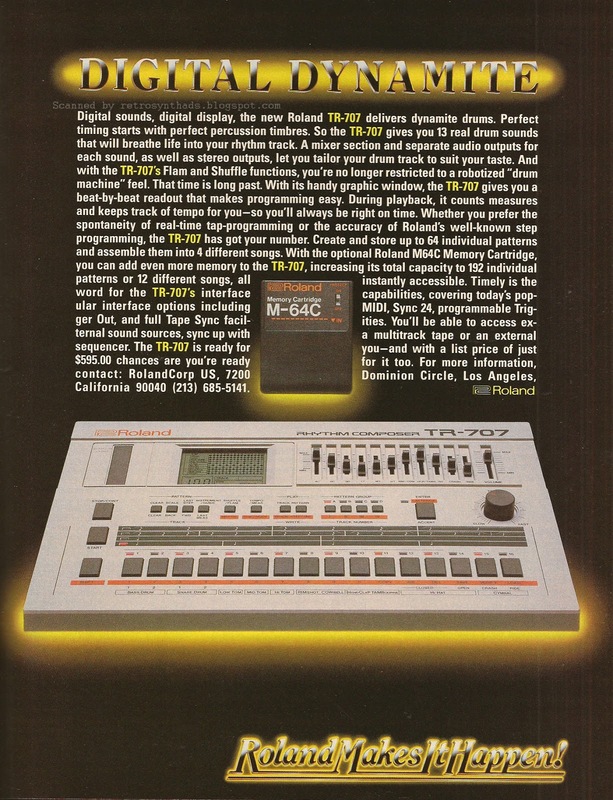 Roland TR-707 drum machine "Digital Dynamite" full page colour advertisement from page 50 in the May 1985 issue of Keyboard Magazine. Coincidentally, it is 7/07 day and to date, this blog has been conspicuously absent of any mention of the TR-707. So, time for that to change. I'm a big fan of the TR-707. The large LCD screen and the fact it has MIDI, DIN sync, trigger out AND tape sync are big pluses for me (well, not so much tape sync any more). The individual outputs and the great little mixer section make it very useful in live situations. 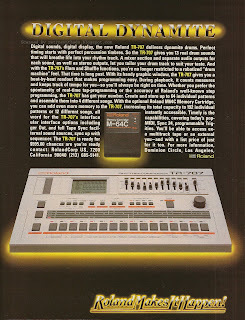 As you can see from the image of the advertisement, this lovely drum machine got swept up in Roland's "Roland Makes It Happen" marketing campaign. The distinctive neon light design style and tag line started to appear in Keyboard and other magazines back in the summer of 1984 beginning with their gorgeous dark blue Juno 106 "Synful" advertisement, and carried on well into the spring of 1986 until ads with a new "computer art" design replaced it - like that used in their TR-505 "Light Heavyweight" ad. Other Roland ads to get the neon "We make it happen" treatment included the JX8p (green) and MPU-401 (baby blue). And of course, this yellow TR-707 ad. But the most memorable piece from this marketing campaign bunch has to be Roland's three-page-plus MIDI-love-fest fold-out that appeared in the July 1984 issue (see right). The ad itself got little play in Keyboard Magazine, making only two appearances - May and December 1985. During this time period, Roland instead chose to give their JX8p and new MPS software (Music Processing System) ads its monthly page real estate. Kinda makes sense since the Magazine is called "Keyboard". The ad copy, although a tad hard to read, includes a lot of useful information, including my favourite historical reference- the price! $595 ain't too shabby. The text also highlights the increasingly rare M-64C memory cartridge, and Roland fortifies its importance by including a not insignificant sized photo. But one of the most interesting and notable features of this ad and others in the series is the size of the Roland logo. Its quite small compared to the other design elements. Normally I'd be freaking out about something like that, but Roland had such a large presence in Keyboard and its products' evolution was so highly recognizable, that they could get away with it. Work in their favour even. A nice position to be in!